FIRST® LEGO® League introduces young people, ages 9 to 16* (grades 4-8), to the fun and excitement of science and technology while building self-confidence, knowledge, and valuable career and life skills. The program challenges kids to think like scientists and engineers. Alongside adult Mentors, teams solve problems using engineering concepts, presentation techniques, and robots. SHPE Cincinnati has been coaching students from AMIS (Academy For Multilingual Immersion Studies) for over 5 years now. 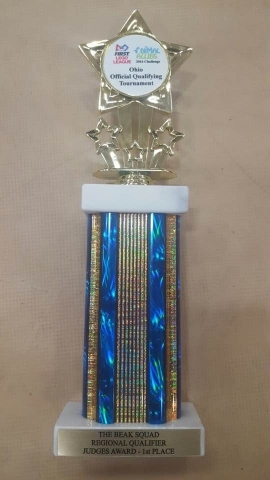 Today our students participated in a qualifying tournament, and while they didn't advance to the next round, they won the Judges Award for "We Work Together" !!!!! 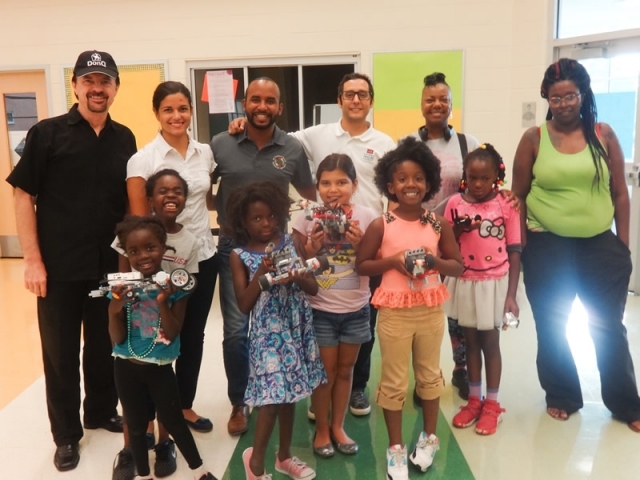 If you would like to help young students in the Elementary School to learn technology (Robotics, Computers) please join SHPE Cincinnati!!! Read more... | 2899 bytes more | Comments? 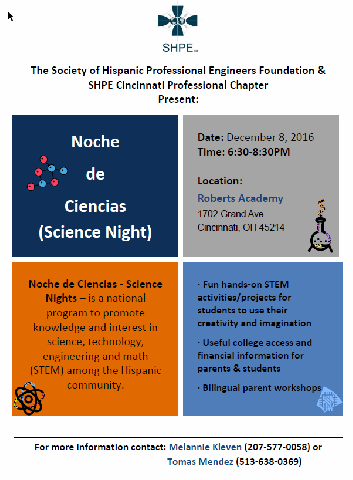 The SHPE Science Night (Noche de Ciencias) is a national program to promote knowledge and interest in Science, Technology, Engineering, and Math (STEM) among the Hispanic Community. Students participate in hands-on STEM activities/projects teaching them how to use their creativity and imagination. At the same time, their parents receive useful college access and financial information, so they can better plan for future college education for their kids. The "SHPE Science Night" at Roberts Academy on Thursday, Dec. 8th, was a total success. Roberts Academy: A Paideia Learning Community! Please contact Melannie Kleven or Tomas Mendez Bernard directly. Tomas Mendez (Duke Energy) and Victor Martinez (P&G) had the opportunity to present to a group of over 60 Hispanic High School students about careers in STEM and how the process of getting to where are today has shaped us as individuals. Unfortunately, many of these kids don't have role models to look up to and we want to change that! We are interested in identifying volunteers that would like to give back and that would help us show our next generation of leaders that there are people that look like them in companies out there. Dater High School has more than 300 Hispanic students and most of them, if not all, come from very poor backgrounds. In fact, 2-3 new kids have been arriving to school since classes started, these kids are new to Cincinnati and in many cases new to the United States. We were very moved by the story of a boy 17 years old that spent 40 days (or 20) in the dessert crossing the border just to find job opportunities to help him better provide to his family (mom and siblings). This boy attends school every day and has 2 jobs after school, to provide for his family while continue to work on his own dreams of becoming a Civil Engineer. We need Volunteers! We need people that would help us help these kids. Help could look like attending once to school and talking to these kids about different career fields, mentoring kids, getting your companies to sponsor different programs, etc... If interested, please contact us and we will be more than happy to enable you to change other people's lives. 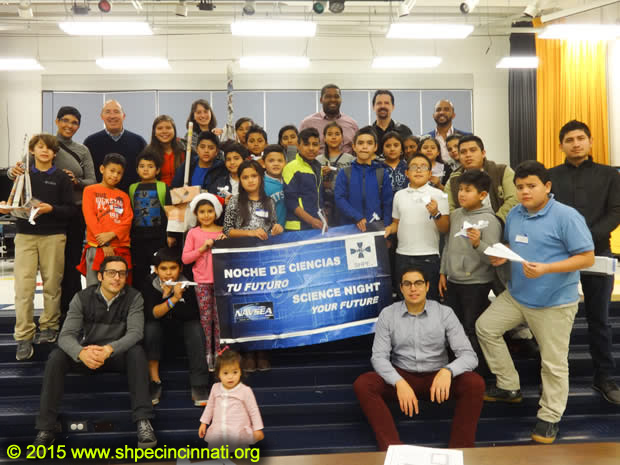 This event was organized by SHPE Cincinnati with help from XOOPS Foundation and West End Community Council, and hosted by Robert A. Taft Information Technology High School.